Corbels originally carved from stone were intended to support an architectural element. In St Mary, however, they are plaster and strictly decorative. They are part of the ornamental plaster works installed in 1858-1859 during the completion of the interior of the cathedral by Bishop William Henry Elder. Examples are found at the base of the window arches and the large brackets surrounding the nave. In gothic architecture, they can include various designs: animal, human or abstracts. In St. Mary, they do not depict particular people, but represent a “subject.” They are usually identifiable by symbols as in the bishop with a mitre, as shown. In St. Mary, there are four principal human “subjects”: king, bishop, crusader and possibly a craftsman. 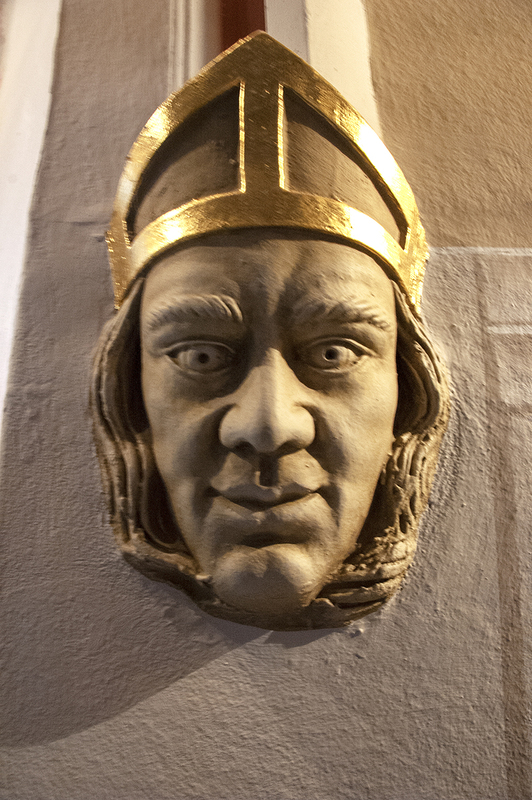 Corbel heads are unique to the churches in which they are found. The corbels had been a mystery for many years as no one seemed to know what they meant or who made them. St. Mary Basilica Archives Committee researched and found some possible answers. Advertisement taken from The Natchez Daily Courier, Nov 12, 1857. Gold leaf was applied by Conrad Schmitt Studios, Inc. during the 1999-2002 restoration. View detailed color photographs of the corbels. Submitted by St. Mary Basilica Archives Committee, March 2019.